About a month ago I wrote about the amazing pear butter that my slow cooker effortlessly pulled off while I wasn’t looking. In the simmering process an incredible amount of liquid accumulated, which I ultimately elected to drain off rather than dilute the jam. The reserved syrup tasted so good I strained and decanted it, then set it aside to refocus on the hot pears. Armed with an immersion blender, a quick blast was all that was needed to render a silky-soft near creamy puree. But I still had no idea what I had. Did all the flavor escape into the syrup? Once cool enough, I gave the pear butter a taste and was thrilled with the results! It needed absolutely nothing: the lemon, coriander, and cardamom all worked in perfect harmony with the pears. So thrilled was I with my good fortune, the jam became my go-to topping and the decanted syrup shifted further to the back of the fridge, pretty much forgotten until recently. That’s when I got a sudden hankering for an Italian soda. 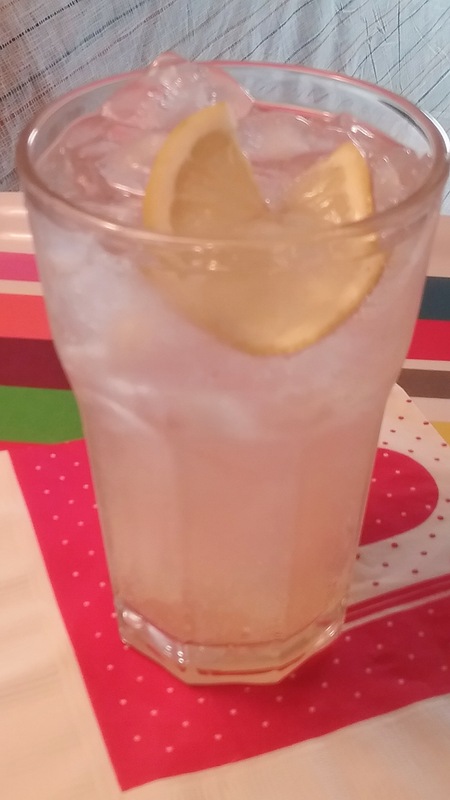 The reclaimed pink-tinged pear syrup is a revelation. Its mysterious essence is not cloyingly sweet, it is exotic yet well-balanced with all the elegance of fresh pears. In a blind tasting I would put this syrup up against anything else on the market. Of course, I do wonder if I will ever be able to replicate it again! But that’s another story. Lacking this fabulous elixir, find the best pear syrup available and create your own divinely refreshing Pear Italian Soda. Fill a tall glass with cracked ice. Pour in 3-4 tablespoons pear syrup, add a dash of bitters, a light squeeze of lemon, top off with sparkling or soda water to taste and stir. Garnish with lemon slice. Serves 1. 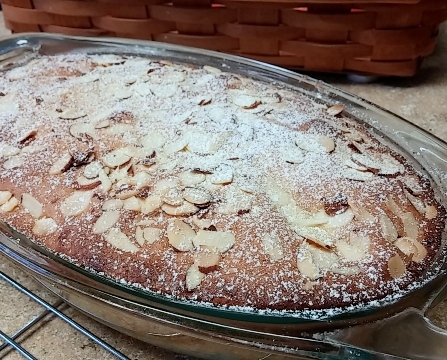 Decidedly Delicious: Pear, Almond, and Ground Rice… Pie? What do you call a pear dessert that is topped with a ground rice cake, of sorts? That is only one of a number of unusual recipes found in Jenni Fleetwood’s One-pot, Slow-pot, and Clay-pot Cooking, (2002) recently purchased on Amazon.com for $.01 plus shipping. Although Jenni’s book has a clear Mediterranean influence with its share of tajines and tians, there is an abundant global feel to it from such specialties as Truffade, an amazing French cheese and potato dish, Brazilian Pork and Rice Casserole, and Stir Fried Crispy Duck. I originally borrowed this cookbook from my local library and was mesmerized by the array of mouth watering photos throughout. By the time I made it to the dessert section and considered the pear and almond dessert with ground rice, absolutely no further enticement was necessary: I wanted it all—immediately. In terms of American dessert vernacular, this pear dish would most likely fall somewhere in the range of cobblers, slumps, and grunts. However, its simple almond-studded-cake-like-topping-dusted-with-powdered-sugar has far more cache than any rustic biscuit or crumble finish. Indeed, now is the time to think pears, since most markets have plenty of varieties to choose from. I went for the Comice. 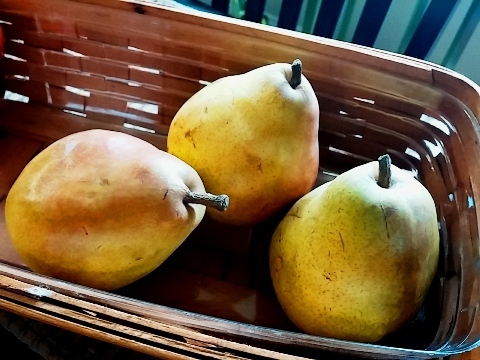 Even though it is known more as a raw eating pear, it is also juicy and incredibly sweet. Turns out, its rich perfume and creaminess were just what I needed, and the wedges held their shape beautifully. While at it, I purchased an inexpensive spice grinder since ground rice has more texture that rice flour. It is this slight crunchy contrast from the ground jasmine rice that adds another fun dimension to the dessert. I suspect cornmeal could be substituted for the rice, but the flavor would not be the same. I served it warm with my convenient custard sauce that seems to be a regular in my refrigerator these days. No question, I would call this Decidedly Delicious. Preheat oven to 350 degrees. Butter a pie dish, then peel and cut the pears into thick wedges and arrange in dish. Sprinkle with brown sugar. Place the butter and granulated sugar in a medium mixing bowl and beat together until light and fluffy. Beat in the eggs one at a time; stir in the almond extract. Sift the flour, baking powder, and salt; add the ground rice and combine the dry ingredients well. Fold it all into the creamed mixture. 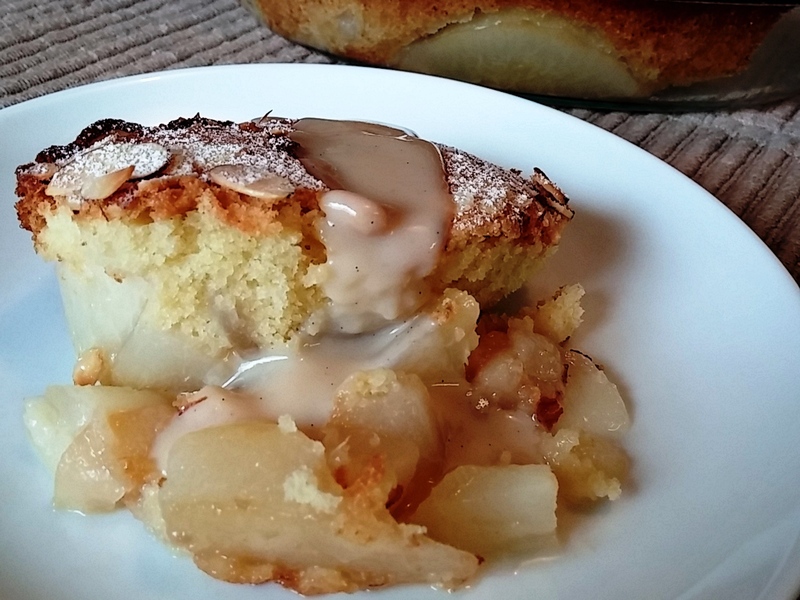 Spread the thick batter over the pear wedges in the baking dish; level the surface with a knife.